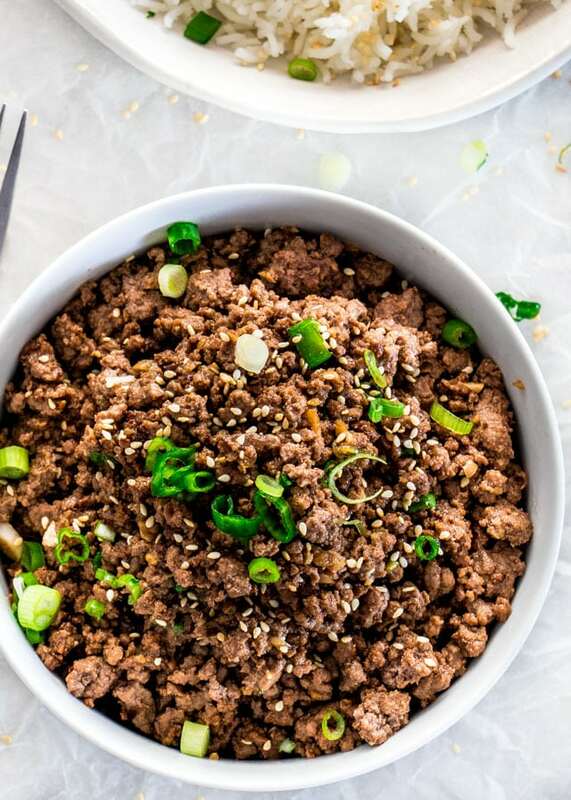 These Korean Beef Rice Bowls can be on your dinner table in only 20 minutes! We’re talking delicious, quick, easy, and budget-friendly dinner! 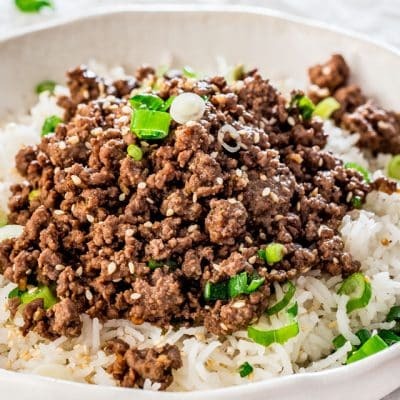 As far as easy dinners go, this is probably right up there at the top because in less than 20 minutes you and your family can enjoy these Korean Beef Rice Bowls. Better than take-out, not to mention way faster. I’m all about these simple dishes, especially for when you’re in a hurry. What’s great about this dish though is how simple it is to put together and I bet you probably have all these ingredients in your kitchen right now. 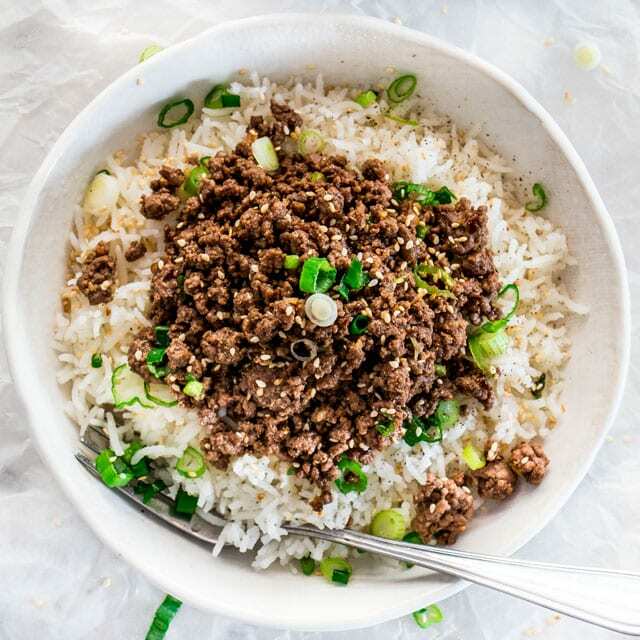 These rice bowls are also quite versatile because while the main ingredient here is just the ground beef, you can customize it to your preference by adding more veggies to it. Try adding veggies like broccoli, asparagus or peppers, to name a few. While I served this over rice, for a healthier alternative consider using cauliflower rice, or even zucchini noodles. You could even use a different type of meat, such as ground chicken, or even ground lamb. You could also even turn this into a salad. This is why I love these types of meals. You could take a basic recipe like this and turn it into anything you want. I really hope you give this a try and I’d love to hear from you if you do. I’m sure you’re going to love it. 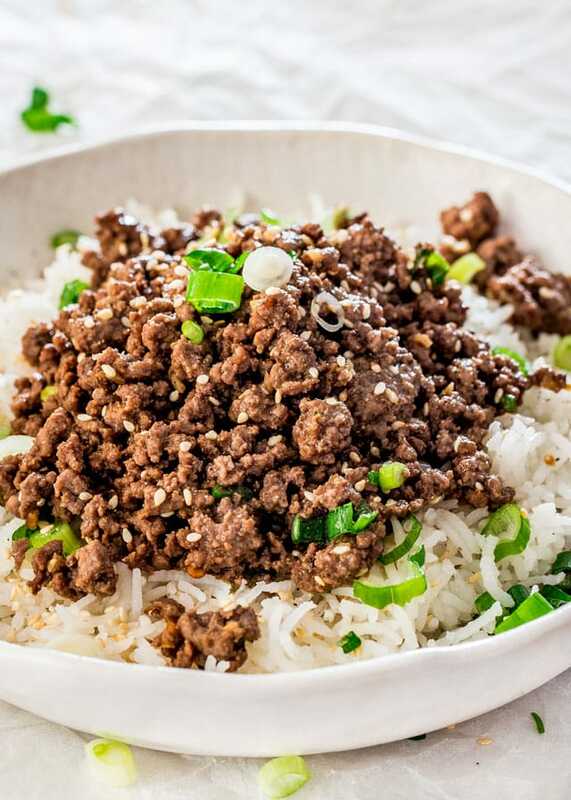 These Korean Beef Rice Bowls can be on your dinner table in only 20 minutes! We're talking delicious, quick, easy, and budget-friendly dinner! Cook the rice according to package instructions. I usually use Basmati rice and I add 2 1/2 cups of water for 1 cup of rice and about 1 tbsp of coconut oil. 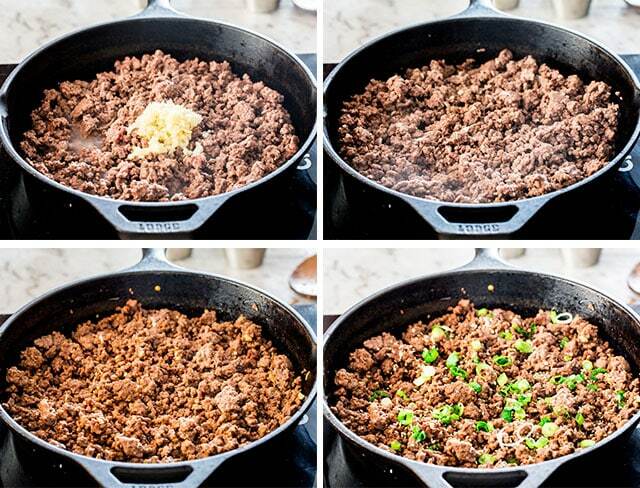 In a large skillet cook the ground beef first for about 3 minutes, breaking it into crumbles, over medium heat. Stir in the garlic and cook for another 5 minutes until the beef starts to brown and no longer pink. In a small bowl whisk together the sauce ingredients and pour over the beef. Let it simmer for another 1 minute while stirring, then remove from heat. 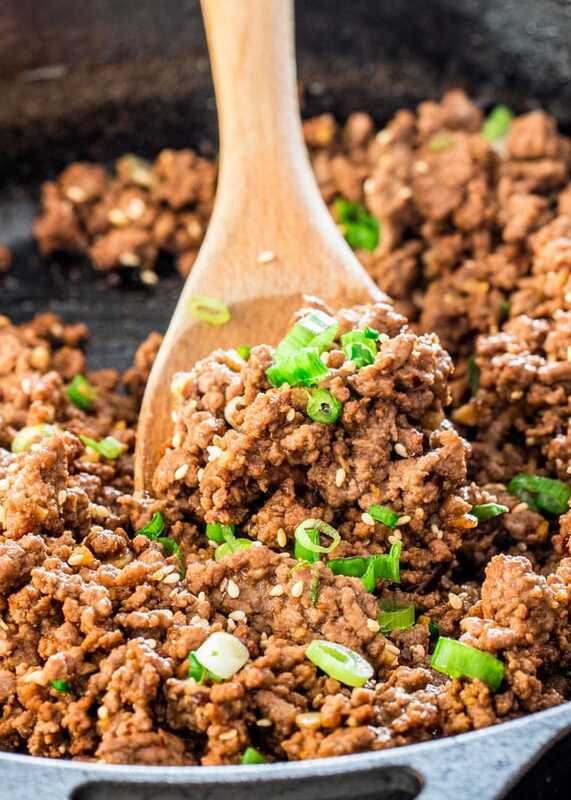 I prefer to cook my ground beef until it almost starts to have some burnt bits, then add the sauce to it. I feel the beef has more flavor this way. Store leftovers in an airtight container in the refrigerator for 3 to 4 days. I made this yesterday, it was lovely and easy to make. Thank you! Do you think ground bear would be a good substitute and is there any flavor adjustment you’d reccomend? Was given a bunch by a friend and not sure what to cook it into. We have never cooked with bear meat or even tried it, so I wouldn’t be able to help you out with the flavors. I would suggest doing some Googling to see if it can be used in place of beef! 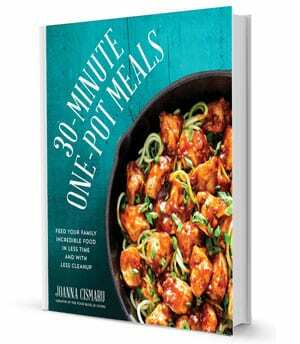 Good luck, I hope it works out for this recipe! Just found your site a couple of days ago. Made this today – yummy! I think I would make a little more rice and double the sauce next time and to have more sauce on the rice but great recipe. 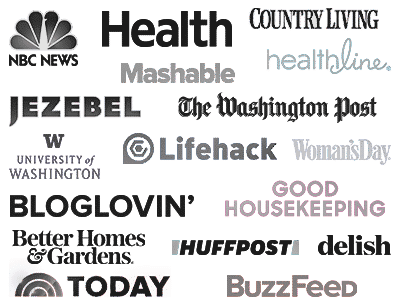 Can’t wait to try some of the other recipes I found on your site. Wow! One of my new faves!! I have made this at least 6 or 7 times in the last month and it is so good. The sesame oil and ginger give it so much flavor and I kicked it up a notch on the red peppers. Yum! My people loved, loved this! WHAT CAN I USE INSTEAD OF SESAME OIL ? Any oil would work, olive oil, peanut, canola, sunflower. Happy you liked it, Lynne! Picky eater liked it! Score!! I just add them for a bit of spice, so I would actually use some Sriracha or hot sauce instead. Another great substitute would be some cayenne pepper. what vegetable would you serve with this? As mentioned in the post, I’d serve this with asparagus or broccoli. I love these, Jo! Marking this recipe as a new fave. I may have upped the spicy chili flakes, just a bit. =) Nicely done.